A stock portfolio co-managed by a child outperforms big names such as Bill Gross at Pimco and Fidelity Contrafund. NEW YORK (TheStreet) -- In early June, when TheStreet published My 8-Year-Old's Portfolio Will Kick Your Portfolio's..., I promised I would update readers on the status of my child's custodial account from time to time. I am pleased to report that she outperforms the market. 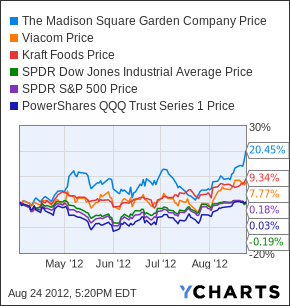 The portfolio's three stocks -- Madison Square Garden ( MSG - Get Report), Viacom ( VIAB - Get Report) and Kraft ( KFT -- outperform the SPDR Dow Jones Industrial Average ETF ( DIA, the SPDR S&P 500 Index ETF ( SPY and the PowerShares QQQ Trust ( QQQ, which tracks the Nasdaq-100 index. Not only has the portfolio outperformed the broader market, but two stocks, MSG and KFT, hit 52-week highs on Friday. VIAB sits just shy of the 52-week high it hit on August 17. Taken together, the stocks have returned 9.8% since the portfolio's inception. That beats the return of Bill Gross's Pimco Total Return Fund as well as Fidelity Contrafund by considerable margins. So, what's driving this thing to such excellent performance? We used the Peter Lynch method of investing, but -- and this is key -- we thought critically about our choices. Who knows where this will go from here, but, as it stands, together, my daughter and I made well-thought-out moves. First, we didn't flub the "buy-what-you-know" strategy, as so many investors do. When we started brainstorming stocks, my daughter suggested the two she knows best: Apple ( AAPL - Get Report) and Pandora ( P. She uses several Apple products at home and school. And ever since I introduced her to Pandora (putting in, by mistake, the wrong date of birth so she could have her own account), she has been a regular user. While both AAPL and P would have been solid choices, regardless of their near-term underperformance relative to MSG, VIAB and KFT, we went with stocks that I think better suit a somewhat conservative portfolio with a minimum 10-year time horizon. From a pure numbers standpoint, in the period since April 3, MSG, VIAB and KFT have outperformed both AAPL and P, which are up about 5% and down about 5% respectively, as of Friday's close. (Though, on Apple's legal punkslap of Samsung, we'll have to see how much of Friday's after-hours gains it hangs onto Monday). KFT occupies a tried-and-true, steady-as-she-goes one-third of the portfolio. We could have gone with a whole host of consumer names here, but chose Kraft because of the dividend, my daughter's familiarity with their products, our belief that they have staying power, and my endorsement of their decision to split into two companies. We chose not to diversify the remaining two-thirds, going with two media companies. Within the space, however, we selected two somewhat different firms. I have written quite a bit about MSG and VIAB. In a nutshell, as a largely regional entity, MSG could not be better positioned. It has prime sports teams, prime venues, a stable of solid sports networks and a music channel on cable that actually plays music. It is enhancing the experience at Madison Square Garden Arena, which will drive some revenue. It just purchased the old Forum in Southern California (I think MSG has big, long-term synergistic plans here). And it's ready to put some cash into driving Fuse, the music channel, hard. In some respects, Viacom is everything MSG is not. It has no sports programming, which is a killer in this day and age of on-demand, time-no-longer-matters IP streaming. Its music channels that rarely play music. A Viacom-MSG marriage makes all the sense in the world. I love owning both as standalones. And as a purist, prefer to see MSG remain independent. However, I expect an increasing amount of partnership and consolidation in the media space. MSG represents a juicy target for bigger companies. Viacom needs to do something to fill its gaping holes. That said, in their present forms, both companies still have ample room to grow. M&A or some type of collaboration only sweetens the deal of being long these two stocks. At the time of publication, the author was long P. He is long KFT, MSG and VIAB in a custodial account he manages for his minor child.